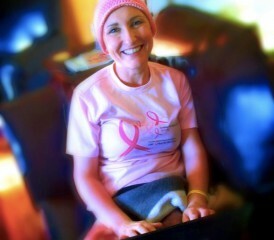 In April, 2011, I was diagnosed with stage 3 breast cancer. Like most people when diagnosed with a life threatening illness, I underwent the typical stages of grieving: denial, anger, bargaining, depression and acceptance. I can almost pinpoint the exact moment that I transitioned from depression to acceptance. It was a beautiful day in October, six months after my initial diagnosis, and my body was under assault from a difficult round of chemotherapy. I was lying in bed, looking through the upstairs window as my mother collected the last of the summer tomatoes from my greenhouse. It saddened me that I was not out there with her, enjoying the sunshine and harvesting the fruits of my labour. Life seemed so unfair. While wallowing in self pity, I came to an important realization. It suddenly dawned on me that feeling sorry for myself was not going to help me to get well. As a Psychologist, I knew that positive emotions such as happiness and joy help to boost the immune system and enhance healing. Negative emotions, such as anger and depression on the other hand, have been proven to suppress the immune system. Since I needed a healthy immune system to fight cancer, a positive attitude was vital to my recovery! I convinced myself that cancer wasn’t THAT bad, hey it even had its perks. For example, since getting cancer, not once did I have to help with the dishes at big family dinners. That thought made me smile, and instantly I felt a little better. I then issued myself a challenge: if finding one perk could bring a smile to my face, I would find 100 perks of having cancer, and so a blog was born. Blogging the perks of cancer has been instrumental in helping me to maintain a positive attitude through my cancer journey. My blogging experience has helped me to recognize two distinct schools of thought when it comes to dealing with a cancer diagnosis. In one camp are those who choose to focus on the pain, suffering and utter devastation that is cancer. There is no denying that few things in life can rival a cancer diagnosis for the award of “worst thing that could ever happen to you.” Cancer brings with it the terror of facing an untimely death; uncomfortable and painful treatments and procedures; loss of identity; coming to grips with a new body image; strained relationships; and financial setbacks or ruin. That is the reality of cancer. But for some fortunate people, cancer brings with it another reality. When faced with their mortality, some people come to realize what is really important in life, and then to go on make life altering changes. I am one of those fortunate people. What gifts has cancer given me? Perk # 13: Cancer boosted my self esteem. Perk # 21: Cancer helped me to find my soul mate. Perk # 25: Cancer connected me to a powerful prayer network. Perk # 28: Having cancer revealed to me a whole new side of my autistic son. Perk # 34: Cancer made me realize my own strength. Having cancer forced me to evaluate my life and make some major changes. I ended some relationships which were not serving me well, and put more of my energy into those which were. I identified toxic work environments, and embraced a change in my career. I started to feed my body only nutritious foods, and made exercise and meditation an important part of my day. As ironic as it may sound, this past year with cancer has been one of the happiest of my life. Would I give up my cancer? Absolutely, in a heartbeat! However, I would not part with the changes that cancer has forced me to make in my life. Some say that a positive attitude alone cannot cure cancer. I agree. However, a positive attitude combined with positive action will give me the best chances of surviving this disease. If I live another forty years, it will be wonderful thing if I can look back on this year and say that I lived it with happiness, joy and grace. If I live only one year, then it is even more important that I be able to say I lived it that way. For that reason, I choose to fight cancer with attitude – a positive attitude. Do you have a “Perk From Cancer?” Share with us on our Facebook or Twitter.